There is a temptation to make a list of criteria, and search for that one community that meets all the qualities on your ideal list. 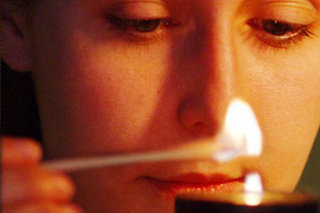 Maybe you’ve even taken an online quiz or gone looking for a Match-website for becoming a nun. (Yes, they really do exist!) However, the only way to really know if a community is a good fit is by checking them out for yourself. There are so many religious orders that it can be overwhelming! Start your search with the people you know. Do you know any sisters at your parish, high school, or college? Are there sisters who work at the local hospital, soup kitchen, or places where you volunteer? Is there someone you know who can introduce you to a nun? Sisters enjoy having other women join them for a meal, for prayer, and as partners in volunteer efforts. When you’re with them, ask how they discovered their community and what qualities they look for in new members. So what about that on-line quiz? Nothing is quite the same as getting to know a group of sisters in person. 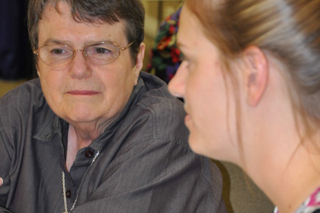 Many communities host weekend retreats designed for those exploring religious life. “Come and See Weekends” are exactly what the name implies! It’s a chance for women to visit one or several communities, participating in prayer, meals, conversation, service projects, and personal reflection. 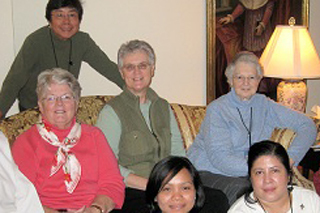 It is a wonderful chance to meet and become friends with other women who are contemplating religious life. Discernment with one particular community is a mutual process in which personal contact between you and its members is essential. Your ultimate choice is further affirmed and confirmed by others – including friends, family, vocation director, spiritual director, community members, and God! It is crucial to connect with the community you are most interested in at regular intervals as the discernment process moves along. This takes a commitment of time and energy for prayer and personal visits. How do I know this is getting serious? Listen for that small, still voice deep within. You’ll know it’s getting serious when you hear yourself saying things like: The more I get to know this community, the more I look forward to spending time with them. I have a strong desire to get to know each person individually. I’m willing to be vulnerable and allow them to see the ‘real’ me. I can really identify with their mission and love the passion they have for following Jesus and his service to people. Communities want to see, hear, and experience all that you are; and for you to see, hear, and experience all that they are in return. They want to feel assured that you will be happy and fulfilled in their community and that you will be a good fit for them as well. When you say “yes” to any vocation, you give your whole selves to another, and they to you. Questions you should ask any community. Authority – What is the leadership structure? How are decisions made? How much voice will I have in decisions about where I live and work in ministry? Demographics – Where is the community located? Are there multiple locations? Is there an international community? Community Spirit and Mission – How often do members of the community get together? What opportunities exist to meet sisters in other parts of the country or the world? 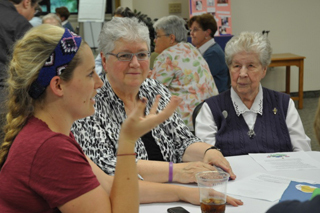 What is the average age of the sisters in the community? Is there an age limit for entering the community? What is their vision for the future? In what way might they envision using my gifts? Education – What opportunities are there to complete a college degree or pursue advanced training in my chosen profession? What about ongoing professional development? Who makes these decisions and how are they paid for? I have an outstanding educational debt, will that prevent me from entering? Finances – How are financial matters handled? From the day-to-day decisions (who buys the groceries?) to more significant financial matters such as health insurance, property management, and retirement funds. What happens if I have debt and will that prevent me from entering? Family Relationships – How do the sisters maintain relationships with their biological families or family of origin? How often can I visit them? Am I allowed to have family or friends visit me? What other ways can I maintain contact with friends and family – phone calls, letters, email, Skype, etc.? Prayer – How and when do you pray together as a community? Is there a designated time for daily Mass, the Rosary, Lectio Divina, Adoration, Liturgy of the Hours? How much time is reserved for private prayer? Do you make a private retreat annually? Technology – Am I allowed to have my own cell phone, computer, or other electronic devices? Am I limited in use of my cell phone or tablet? While some of these questions may arise in conversation with the vocation director or other community members, here are some important questions to ask yourself: Am I comfortable with my sexuality? How comfortable am I with the idea of living a chaste and celibate life? How do I experience and express intimacy in relationships? Will I be able to adjust to my new family of sisters in making decisions together when those decisions may impact me? Am I comfortable sharing household tasks and community transportation? Is this a place where I will feel supported and loved for who I am, and where I can grow in love with God and serve others from this community of support? Finally, if you are truly called to religious life, know that there is not a wrong choice. Discernment is both an informed decision and a spiritual process. Ultimately, the best decision is one where you feel like “I’m home.” This is a place where I am supported and loved for who I am, and where I can grow humanly, grow in love with God and serve others from this community of support. You will find yourself saying, “I cannot imagine not being here.” And they will feel the same about you!